A break down of the industry’s financial performance and impact in third quarter 2015.
Credit unions lent more than $1 billion per day, on average, through September 2015. Loan originations increased 18.1% year-over-year and totaled nearly $310.4 billion in the first three quarters of 2015. Total loan balances expanded 10.7% year-over-year in September while shares grew 5.7%. This greater loan activity pushed the loan-to-share ratio up 3.5 percentage points to 77.5%. As a result, many credit unions are nearing the loaned-out mark. The median credit union loan portfolio growth was 4.1% year-over-year. Performers in the top 20th percentile posted 12.5% growth while those in the bottom 20th percentile reported their loan portfolios shrunk 4.1% over the period. Source for all graphs, rankings, and maps unless otherwise noted: Peer-to-Peer Analytics by Callahan & Associates. Credit unions expanded their industry-wide auto loan portfolio by 14.8% year-over-year, reaching $257.9 billion as of September 2015. 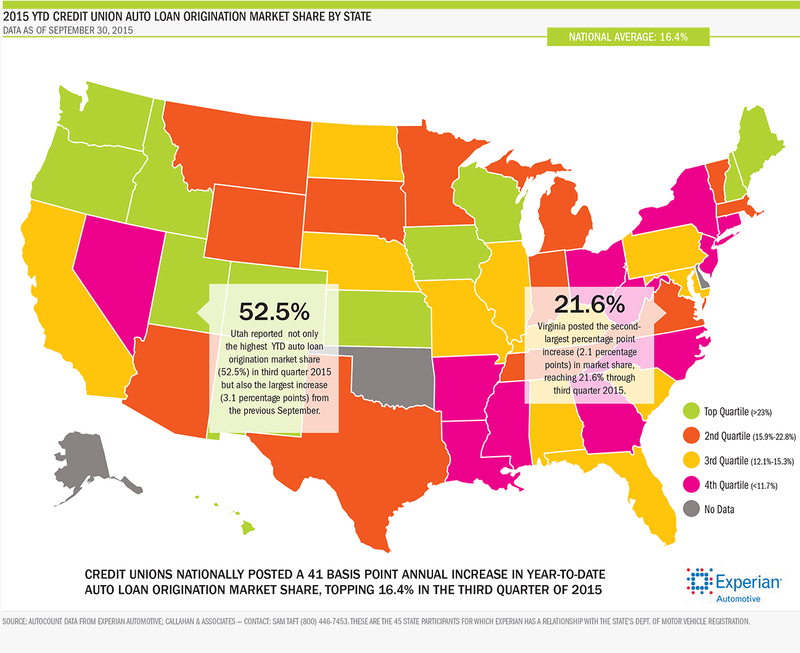 New and used auto loans increased 17.6% and 13.2%, respectively, over the past 12 months. For new autos, this was 1.8 percentage points lower than last September's growth yet still topped 2013 growth levels by 6.3 percentage points. Indirect loans comprised 51.3% of total auto loan balances this September, up from 48.4% in 2014. Indirect balances increased 21.5% year-over-year and topped $132.3 billion, outpacing direct auto loan growth by 13.0 percentage points. Credit unions reported a median year-over-year auto loan growth rate of 6.3% as of September 2015, up from 4.0% the previous September. Credit unions originated $96.0 billion in first mortgages through September 2015, the second-highest year-to-date amount in the industry's history. Accordingly, balances of outstanding first mortgages also expanded, growing 10.1% from September 2014 to September 2015. As a percentage of the first mortgage portfolio, fixed rate products declined slightly year-over-year, falling from 59.9% to 59.0%. Balloon/hybrid and adjustable rate products, on the other hand, increased their share, growing to 25.3% and 15.7%, respectively. Reportable first mortgage delinquency fell 18 basis points between September 2014 and 2015, the largest drop of any loan product. Net charge-offs declined five basis points over the same period. Credit unions in the bottom 20th percentile sold on average 17.7% of their first mortgage loans to the secondary market while top-selling credit unions in the upper 20th percentile sold 82.6% on average. The industry median for sales to the secondary market as a percentage of total first mortgage originations was 47.4%. This ranking excludes credit unions which reported no sales to the secondary market in the third quarter of 2015.
credit cards make this product a solid income stream for credit unions. 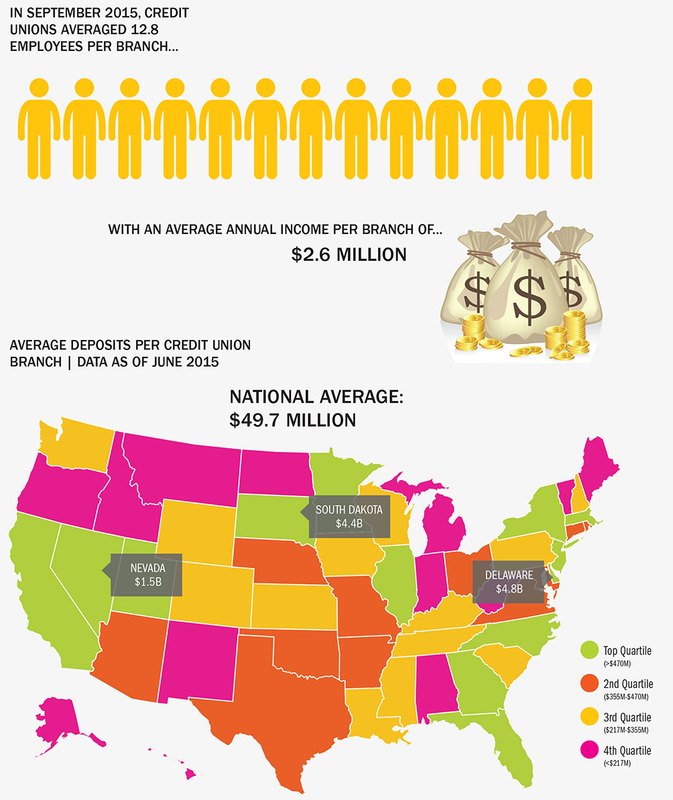 Today, 58.4% of credit unions nationwide offer credit cards; that’s up from 57.2% in September 2014. Notably, credit unions have posted year-over-year increases in credit card balances, and total credit card loans outstanding now top $47 billion. Overall, the industry has increased its credit card portfolio by more than $2.9 billion over the past year — that’s a 6.5% year-over-year growth. The number of active credit cards increased 7.4% to an all-time high of 17.5 million thanks, in part, to the addition of 1.2 million card accounts since September 2014. For all three percentile rankings (bottom 20th, median, and top 20th), credit card utilization rates declined slightly from the previous September's levels. Share balances increased 5.7% and surpassed $1 trillion in the third quarter of 2015. At $366 billion, regular shares account for the largest portion of the portfolio. The number of share draft accounts reached a new high of 56.9 million, with an average share draft balance of $2,462. Strong core deposit growth fueled overall share growth, with core deposits — regular shares, share drafts, and money market shares — increasing 7.9% year-over-year to $736.6 billion. Average share balances increased 2.0% year-over-year. Credit unions in the top 20th percentile reported an average share balance of $9,633, while those in the middle 50th and bottom 20th percentiles reported $6,637 and $4,123, respectively. The number of credit unions that have member business loans on their balance sheets increased to 34.4%, up 86 basis points from 33.6% in September 2014. Outstanding member business loan balances expanded 12.3% year-over-year to $50.9 billion as of September 2015. Although they are growing in size and popularity, member business loans account for only 6.5% of the total credit union loan portfolio. That’s the second-smallest loan product followed by credit cards. However, credit unions participating in member business lending did outperform credit unions that do not offer member business loans across a variety of metrics, including ROA, delinquency, and member and share growth. The most notable difference is loan growth. 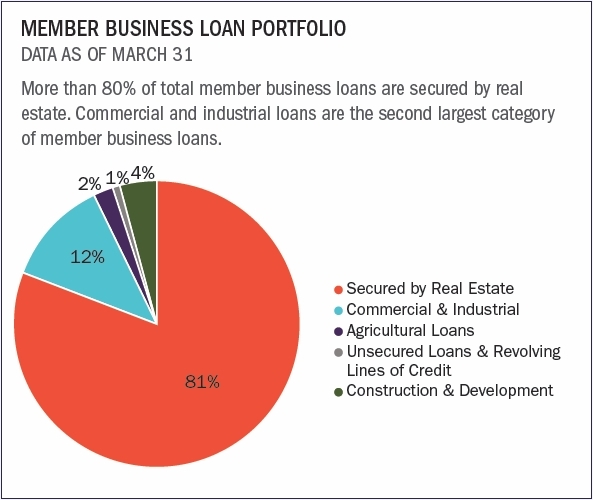 Credit unions that participate in member business lending expanded their total loan portfolio 11.8% annually, compared to 6.2% for credit unions that do not. The median MBL delinquency for the industry was 1.3% as of September 2015, nearly 4 percentage points lower than credit unions in the bottom 20th percentile who report delinquency of 5.3%, but over 1 percentage point greater than the top 20th percentile, where credit unions posted an MBL delinquency rate of 0.3%. As of September 2015, the industry held $350 billion in investments, posting quarterly and annual declines as the trend of credit unions funding more loans continues. The average investment maturity was unchanged in the third quarter of 2015. Similarly, the average yield on investments remained steady at 1.24%. Today, the average life of credit unions’ investments is 2.1 years, down from a year ago but relatively unchanged from the previous quarter. If rates increase going forward, the portfolio is likely to be extended due to slower MBS activity and new investments further out on the curve. The median yield on average investments stands at 0.95%, up from 0.89% a year ago. Credit unions ranked in the top 20th percentile report an investment yield of 1.34% while those in the bottom 20th report just a 0.56% yield. The percentage of members that use a credit union for their day-to-day financial transactions, measured via share draft penetration, increased 1.4 percentage points annually to 55.1% as of September 2015. This represents the highest share draft penetration ever recorded. Credit union employment has also kept pace with member growth, as members per employee — a gauge of how much of their resources credit unions are allocating to member service — declined only slightly to 385 this September versus 386 one year ago. Members are increasingly choosing credit unions as their primary financial institution. Between September 2014 and September 2015, the average member relationship increased $639. Despite a 2.2% national decline in investment income between September 2014 and September 2015, total interest income increased 6.4%. A 7.0% rise in loan interest income buoyed this growth. Non-interest income was again a strong contributor to growth in the third quarter, as total non-interest income expanded 9.6%. This included an 18.2% increase in other operating income, largely attributable to income from mortgage sales on the secondary market. The net interest margin also improved slightly, rising one basis point from September 2014 to 2.86% as of September 2015. However, this remains below the operating expense to average assets ratio of 3.12%, indicating a continued need for non-interest income. ROA declined slightly year-over-year as asset growth outpaced net income growth. The industry median in September 2015 was 0.35%. Credit unions ranking in the bottom 20th percentile reported an average ROA of -0.04% while those in the top 20th percentile reported 0.82% ROA. Data from Callahan's Peer-to-Peer and Mortgage Analyzer tools reveals where credit unions are building out their branch networks and where they are taking locations away. Credit unions active as of September 2015 show an increasing number of branch locations, contrary to the total industry numbers. This indicates the decline in credit union branches is due to credit union closures, not voluntary branch closures. I'd be interested to see if the reduction in branches in some states coincides with an increased participation in shared branching. Did these CUs expand their service access while reducing the expense of full-service branches? Nicely illustrated analysis, well done. I am just curious about the figures used for average deposits per credit union branch of $497.6Million. Is this correct, seems really high. Thank you for pointing that out. You are correct, and we have corrected the map.